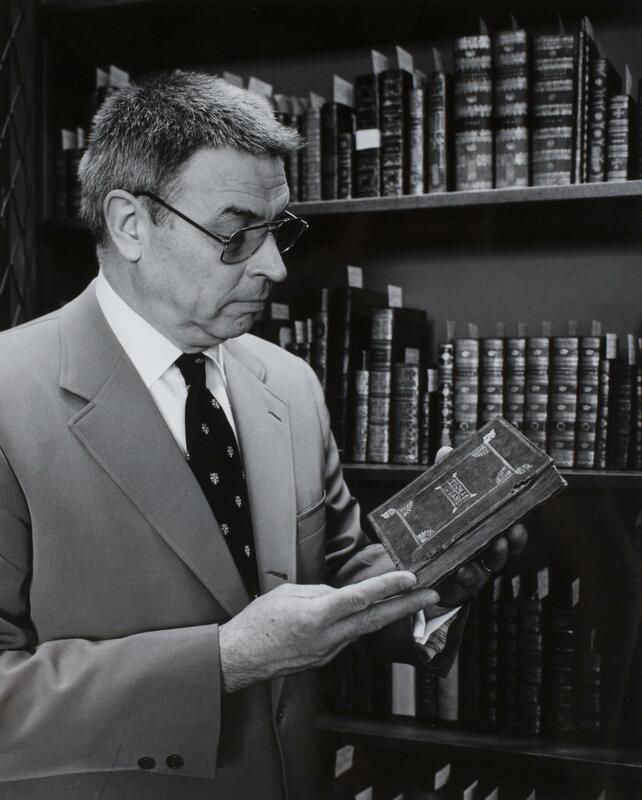 Marcus A. McCorison, 86, described by the Wall Street Journal in 1986 as the tiger of rare book librarians, died, surrounded by his family, on February 3, 2013, in Worcester, Massachusetts. McCorison’s skills as a noted librarian, bibliographer, and scholar of early American printing were informed by his intense personal interest in American cultural history. He was named president emeritus of the American Antiquarian Society at his retirement in 1992, following thirty-two years of distinguished service as the Society’s librarian, director and then president. McCorison, sometimes referred to as the “Grand Acquisitor,” expanded the Society’s holdings by some 115,000 items and greatly enhanced access to the Society’s collection by creating a machine-readable catalogue system and encouraged the production of bibliographies that would include AAS holdings. He laid the foundations for a scholarly community through the establishment of the fellowship program to draw visiting scholars from around the world to Worcester. McCorison also enlarged the institution’s endowment with vigorous and successful fundraising campaigns and personal appeals to potential donors. After serving with the United States Naval Reserve during World War II, McCorison graduated from Ripon College in 1950 and earned masters degrees from the University of Vermont (1951) and Columbia University (1954). His academic study was interrupted by U.S. Army service as a first lieutenant in Korea in 1951-52. His first professional position was of the Kellogg Hubbard Library in Montpelier, Vermont. In 1955 he became the chief of rare books at Dartmouth College. McCorison served as of Special Collections at State University of Iowa in 1959. After accepting the position of librarian at the Society in 1960, McCorison moved to Worcester and gradually became involved with most of the historical associations in the region. He was a trustee of The Fruitlands Museum in Harvard, Massachusetts until 1989 and was a trustee of both Old Sturbridge Village and Historic Deerfield. He was a member of the Club of Odd Volumes, the Society of Printers, the Colonial Society of Massachusetts, the Massachusetts Historical Society, Worcester Club, Worcester Fire Society, St. Wulstan Society, and United Congregational Church. McCorison was also an honorary member of the New-York Historical Society, Ephemera Society of America, Zamorano Club of Los Angeles, the Century Association, and the Roxburghe Club of San Francisco. His professional contributions include service as president of the Bibliographical Society of America, on the Board of Governors of the Research Libraries Group, as a founder of the Independent Research Libraries Association, trustee of the Vermont Historical Society, and councilor of The Grolier Club. McCorison’s consultancies included the National Endowment for the Humanities, Folger Shakespeare Library, Independent Research Libraries Association, Library of Congress, and the Newberry Library. He was awarded Distinguished Alumnus Awards from Ripon College and Columbia University’s School of Library Service. Honorary degrees were bestowed on McCorison from Assumption College, Clark University, College of the Holy Cross, and the University of Vermont. McCorison authored numerous books, pamphlets, and scholarly articles. In 1963, after thirteen years of research, he published his “Vermont Imprints, 1778-1820,” which lists every known item printed in Vermont before 1821. His essay entitled "The Annals of American Bibliography, or Book History Plain and Fancy" was published by the University of Texas in 1991, the same year his "Humanists and Byte-size Bibliography, or How to Digest Expanding Sources of Information" appeared in the “Proceedings of the American Philosophical Society.” McCorison produced dozens of catalogues and articles on the history of American printing and printers, including "Isaiah Thomas, The American Antiquarian Society and the Future" (1981), and "Early American Bookbindings from the Collection of Michael Papantonio" (1983). Recently, McCorison completed the essay, “Percy Grassby 1882-1972, An Outsider Inside Boston’s World of Print” (2012), designed by his great friend and collaborator, Roderick Stinehour for the Society of Printers and “Ben Tighe, Book Scout: His Memoirs” for the Baxter Society (2012). Marcus McCorison was born on July 17, 1926, in Lancaster, Wisconsin, son of Rev. Dr. Joseph Lyle McCorison, Jr., and Ruth Mink McCorison, formerly of East Corinth, Vermont. Marcus was married for forty-eight years to Janet Buckbee Knop, who died in 1998. He was predeceased by a daughter, Mary (Mrs. Joshua L. Rosenbloom). He is survived by his dear friend, Carolyn Knight Dik; a sister, Virginia Simmons; four sons, Marcus II and wife Helen, Andrew and wife Stacey, James and companion Karen, Peter and wife Catherine; a daughter, Judith and husband Jeffrey Gove, and eleven grandchildren: Emily, Justin and Molly Gove; Sarah and Matthew McCorison; Samuel and Melanie McCorison, Jacob McCorison; Benjamin, Nathan and Timothy Rosenbloom. Marcus’ accomplishments were many, none more so than the respect and abiding love of his family and friends. A memorial service was held on February 16 at 11 a.m. at United Congregational Church, 6 Institute Road, Worcester, Massachusetts. A reception followed at the American Antiquarian Society. An additional memorial was held in April in New York. A memorial book fund has been established at the American Antiquarian Society to honor Marcus and his work to collect, preserve, and make useful the written record. Support the McCorison Book Fund now.